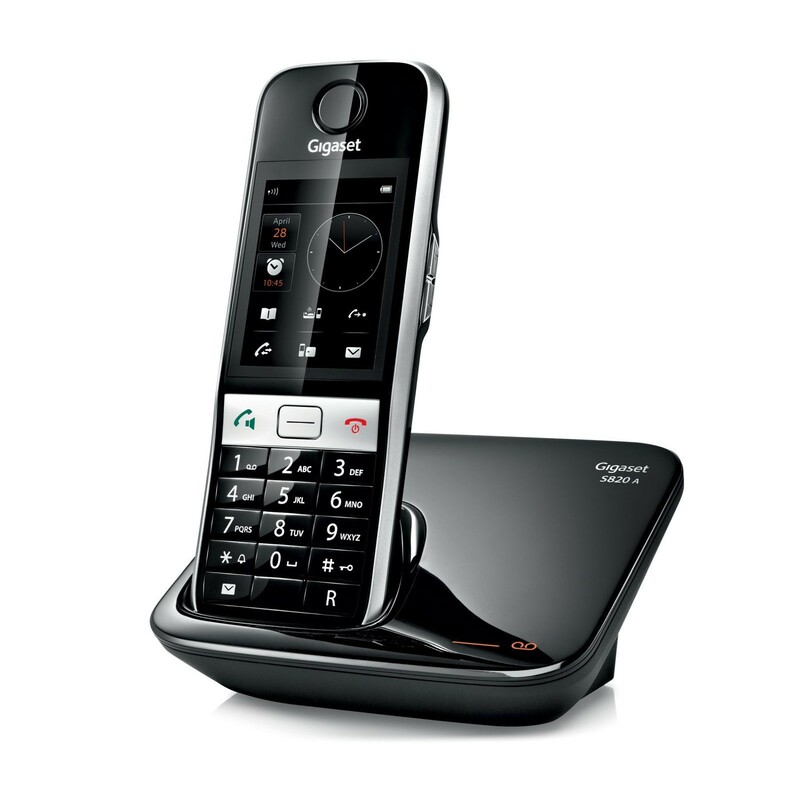 For cutting-edge design, features, and performance: the Gigaset S820A. With its large 2.4” touchscreen, high-quality keypad, and sleek black finish, this stylish cordless handset adds a touch of class to the home or office. Recently topping the Which? Best buy guide for cordless phones, and boasting an array of advanced features such as data synchronisation with Outlook, Bluetooth capabilities, call silencing, and anonymous call blocking, this is another top of the range phone from Gigaset. The Gigaset S820A comes packed with customisable features to take advantage of. For instance, set up the S820A to forward calls and texts to your mobile for when you’re not going to be around but need to stay in touch. Or take control of when calls are received with the call silencing facility and avoid unwanted disturbances at inconvenient times of the day or night. You can also configure the idle screen to display your six most used or favourite functions so they are always just one touch away, and avoid having to manually enter each number into the 500 name and number address book by conveniently transferring contacts via Bluetooth. Conversations can be enjoyed in brilliant clarity thanks to the in-built High Sound PerformanceTM technology. And with an incredible continuous talk time of up to 20 hours, and a staggering 250 hours on standby, the Gigaset S820A allows you to continue conversations for as long as you need. The volume of calls is easily adjustable with a convenient side key, and there is a high-quality loudspeaker for hands-free talking at the touch of button. With an answering machine boasting up to 55 minutes recording time, easy access to call lists, a baby monitoring function, and expandable up to six handsets, the Gigaset S820A can meet the demands of most. And with eco credentials to save the environment (and you money), this is a superbly crafted phone delivering great features and quality. Really liked this product initially. I have bought 5 gigaset S820 handsets and only one of them is still working with the touch screen. The touchscreen stops functioning after about one year. As it has happened to 4 handsets I would say this is a manufacturing fault because everything else works perfectly. I have just purchased another 2 handsets but this time gone for the cheaper C530 A. Would never buy another Siemens Gigaset with a touch screen and I wouldn\'t recommend. Bought for a separate line in my home office and have been thoroughly impressed with it so far. Decent sound, large phonebook (ideal), and good look and feel to it. Thinking about getting the same set (or something similar from Gigaset) for our home. Service from ligo was great - fast delivery, helpful staff! This is a superb cordless phone. Very clear sound and excellent range. I bought this model so that I could transfer my addressbook from outlook, which no one else seems to have mentioned. Really useful feature and very easy to do. Touchscreen a little tempramental at times but can\'t rate this product highly enough! Had minor irritation with trio set, whereby 2 handsets of the trio set would occasionally enter standby mode, where you were unable to answer a call. Called and spoke to a very helpful person at ligo for advice; was advised not normal, and had option to return set for a replacement, or pay for a replacement, get provided with a pre-paid returns label to allow us to receive the new set, setup and confirmed all ok, return the original set for a full refund. After this replacement set had been setup, I managed to call Gigaset (which were closed at the weekend when I had originally called for advice) which had also provided myself with some other hints and tips, none of which would had resolved my original query. Had the new phone set for nearly 2 weeks now, still on 1st full original phone charge, all are working great, even found another few features I had missed on initial setup. Still very pleased with decision to purchase both a Gigaset product, and this particular model with it's many features. It is very easy to use, and the sound quality is excellent, both on the handset earpiece and on loudspeaker. Initial use of the touchscreen was a letdown, compared to our iPhones, but once you consider there are massive differences in the touchscreen technology used, and you use the touchscreen more often, you actually find it is very responsive, you just have to ensure your finger movement is sufficient to select your given choice. I would recommend highly recommend both Gigaset and this particular model with it's very long battery talk and standby time, as well as ligo for a phone supply company that you can trust.